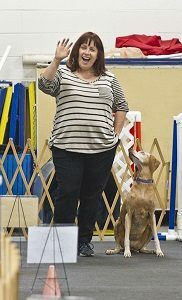 Amy Wukotich is interested in everything about dogs and is a big fan of versatility. She trains and competes with her own dogs in rally, agility, barn hunt, lure coursing, obedience, conformation, and nose work. She’s an all-level Rally judge for UKC, WCR, and C-WAGS. In addition to dog sports, she’s very involved with several rescue organizations where she helps evaluate temperament, work on behavior issues and foster dogs. She is currently serving as a board member for the Illinois Doberman Rescue Plus and a foster home for the American Manchester Terrier Club. Her canine family consists of Vizslas, Manchester Terriers, and a Doberman.